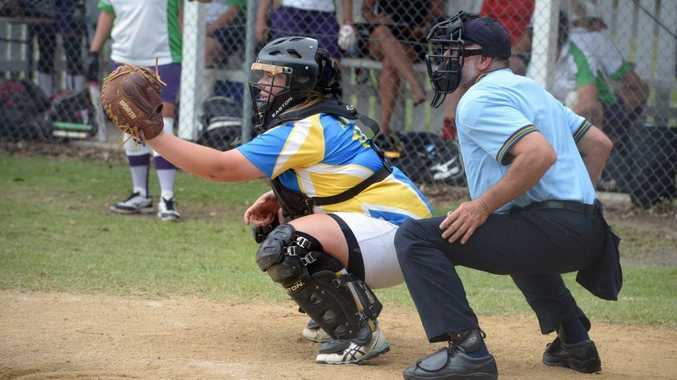 FOR the first time this softball season Waves Tsunamis put all 10 registered A-grade players on the diamond and in a double header against Bargara Bullets and Eels/United the 2013-2014 champions recorded a win and a draw. In the early game Waves belted Bargara 15-6 before giving up an early lead to draw 9-9 with Eels/United to get five points from the available six to close the gap on the ladder leading Bullets. But Waves knew it was the perfect time to perform. With regular pitcher Nadia Dittman out of the Bargara line up Waves had to make the most of the chance and the players did what was needed, and when Gemma Bush left the diamond after being struck in the face when a pitch was belted back at her Waves ran away with the game. After only training once since Christmas because of the wet weather Waves' Lee-Anne O'Leary said the batting was better than it had been in the past few weeks and the addition of a couple of players helped the cause. "It was the first time we had beaten Bargara since the start of the season and it was the first time we had all 10 registered players available," O'Leary said. "Ashlyn Chapman came from Brisbane to play the double header, and she will play in the finals and Mel Steele came back from injury (elbow). "It was good to have everyone available and good to get five out of the six points." O'Leary might not have the same number of players for this week's return game against Bargara with her daughter, Kaitlyn, in doubt because he is having wisdom teeth pulled Wednesday and could have to pull out. In the other men's games Wests Lynx beat Souths Sluggers 17-2 and Eels/United flogged Waves Cruisers 13-6. Games this week: Men, Eels/United v Souths Sluggers and Wests Lynx v Waves Cruisers; A-grade Bargara Bullets v Eels/United and Bargara Bullets v Waves Tsunamis.